Have you ever experienced a bone fracture? Probably so, as individuals living in developed countries are prone to an average of two fractures in their lifetime. I’m in my 20s and have had three fractures. They’re no fun. One of the worst parts? The cast. They’re bulky and itchy. They collect sweat and they can’t get wet, so obviously they develop a horrendous stench. And more itching. Sure, they hold the bones in place to heal properly, but you’re miserable while they do it. A graduate of Victoria University of Wellington, Jake Evill, has a novel idea to change all that. 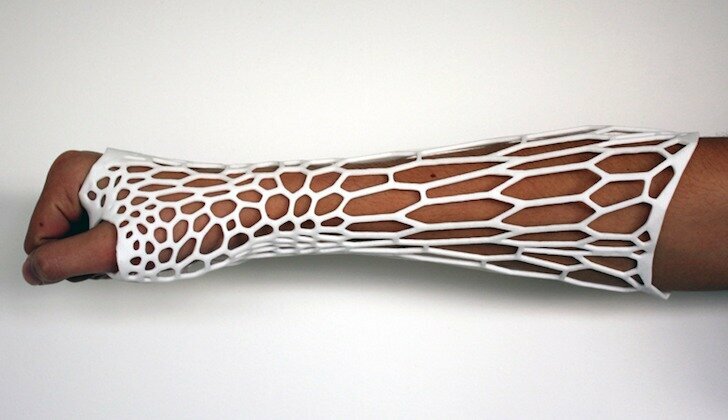 His creation is the Cortex, a revolutionary brace that’s 3D printed. The process is rather simple, just like most of the best ideas. Just like with every fracture, an X-ray is taken to find out exactly where the damage is. Then a 3D scan is taken of the limb. The information from both of those procedures is processed through an algorithm that generates a bio-shaped brace. It’s made to be a perfect fit. The algorithm makes the structure more rigid around where the fracture is, but the whole thing is able to breathe. It’s printed from nylon so it’s not itchy, and it can get wet. And because it’s thin, it doesn’t restrict clothes. It’s everything a cast wants to be. Being printed in two pieces, the Cortex is clasped around the limb. Theoretically that means it could be taken off and put back on, something no cast can do. That’s important because casts are left on a little longer than necessary because if they’re taken off too early then another one has to be put on, which is just wasteful. The Cortex would require orthopedists to have 3D scanners and printers, but they’d likely pay for themselves in money not spent on plaster. It’s a rather aesthetic brace too, almost fashionable. Though, there’s less room for people to sign it. Oh well.